Thieves targeted the former Beatle's house in St John's Wood on the evening of 7 December. 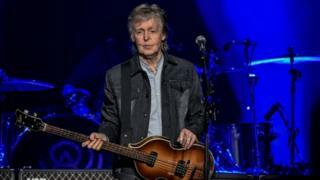 It is unknown if the musician, 76, or his wife Nancy Shevell, were home at the time of the break-in, which came days before he played a concert in his hometown of Liverpool. No arrests have been made and the investigation continues, a Metropolitan Police spokesman said. Sir Paul is due to play at London's O2 Arena on Sunday.